The Buffalo Bandits just re-signed John Tavares to a one year contract, ensuring that JT returns for his twenty-second season in the NLL in 2013. The Bandits acquired JT by trading Brian Nikula to the Detroit Turbos in October of 1991. This was before the Bandits had ever played a game in the NLL, so there has never been a Bandits team without Tavares on the roster. What was the world like back then? Of the current NLL teams, only the Philadelphia Wings were in existence. The Colorado Mammoth franchise existed: the Baltimore Thunder would play eight more years in Baltimore before moving to Pittsburgh for one year, Washington (D.C.) for two years, and then finally Colorado in 2003. The world wide web had not been invented yet. 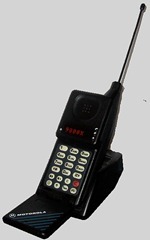 The cell phone pictured here was the state of the art. Freddie Mercury, Audrey Hepburn, Kurt Cobain, and Frank Zappa were still alive. Growing Pains, Who’s The Boss?, The Cosby Show, and Johnny Carson were still on TV. The Soviet Union and Czechoslovakia still existed, George Bush (Sr.) was the US President, and Brian Mulroney was the Canadian Prime Minister. Apartheid was still in effect in South Africa. Magic Johnson and Larry Bird were still playing in the NBA. The San Jose Sharks were playing their first season, as were Nicklas Lidstrom, Adam Foote, and Martin Brodeur. The Buffalo Bills had lost two Super Bowls in a row (something they would later repeat). Tyler Seguin, Taylor Lautner, Miley Cyrus, Johnny Powless, and at least two of the writers over at In Lacrosse We Trust were not yet born. This entry was posted in Buffalo Bandits, History. Bookmark the permalink.